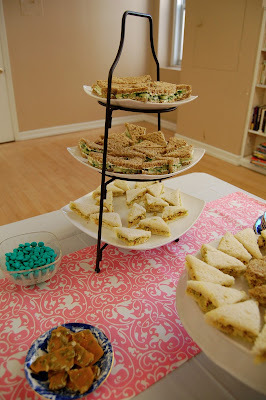 I helped host a baby shower for a good friend this past weekend, and I wanted to share a few photos with you, along with some of my resources for making the party happen without a hitch. While my official event planning days may be behind me, I do enjoy planning events from time to time, especially for something as special as a new baby on the way. 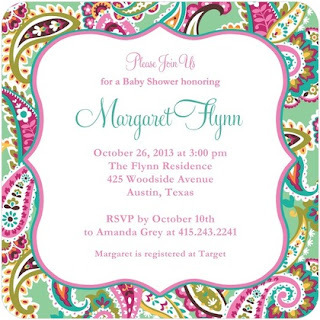 A paper invitation is a must, and I absolutely love the new Vera Bradley line available at Tiny Prints. 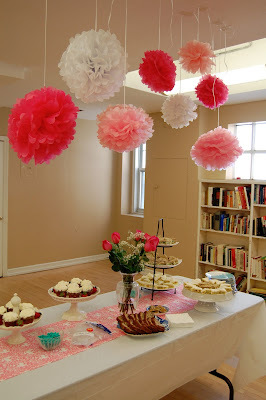 Here's the one I chose for our spring/afternoon tea-themed shower. So pretty! Thanks to Pinterest, I'd seen the onesie laundry line decorating idea already, and thought it was super cute. I think ours turned out pretty nice as well! We sent guests home with adorable onesie cookies from Mama's Custom Cookies. I just love how these turned out, and it was so nice to send guests home with a little favor from the afternoon. Mama's ships priority mail and they arrived in cellophane bags ready to be handed out. We left a journal out so that guests could leave a special note for the Mama-to-be, whether it was advice, words of encouragement or helpful tips as she begins this new adventure known as motherhood. The menu consisted of 2 types of sandwiches (cucumber and chicken salad), banana bread, red velvet cupcakes with cream cheese frosting and lemon meringue pie. We had tea, coffee and punch (rasberry sherbert & 7 Up... easy!) on hand, too, and not surprisingly, we didn't come back with many leftovers! The best part of the afternoon, however, was seeing the smiling face of the Mama-to-Be. Congratulations, Audrey! throwing a baby shower is one of life's real happy moments! I work in a library and I always try to give "book showers". We get a really nice basket of some kind and everyone wraps up books new and gently loved and fill it up! Something with frosting and flowers and a sweet invitation makes for a lovely memorable event! You did good! Love the decor! The oneies cookies are too adorable. Sigh . . . I get so jealous when I see how creative some people (like you) are. I've never thrown such a pretty baby shower. What cute, cute ideas!